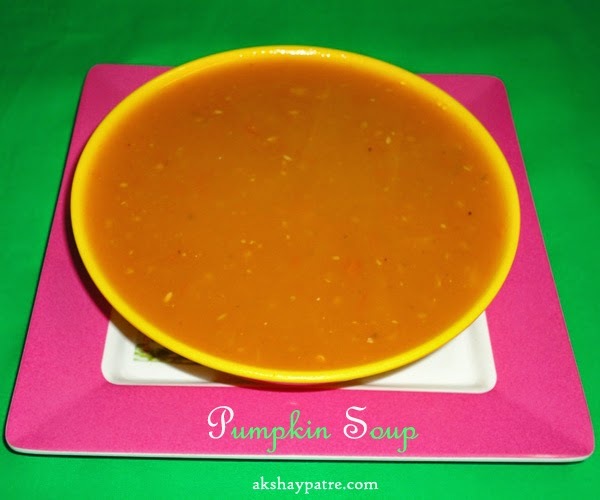 Pumpkin soup recipe - Are you a weight watcher? Here is the perfect low calorie pumpkin soup recipe for you. A soup made with pumpkin and tomato is always healthy and very low in calories. I have been trying to make soups using various low calorie vegetables. One of them is pumpkin soup. Pumpkin contains antioxidants and it is rich in vitamin A . Pumpkin is weight watcher's favorite vegetable, since it is low in calories. There are few varieties of pumpkins available all round the year. Among them, dark yellow or orange colour pumpkins are tasty and popular. Sometimes I prepare pumpkin subzi and sometimes pumpkin paratha and thepla. 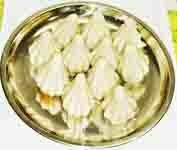 The most common traditional sabzis prepared in South Karnataka is dudde sukke. 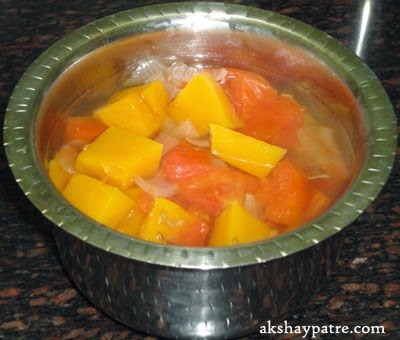 Pumpkin is known as dudde in konkani, kumbalkayi in kannada, kaddu in hindi and lal bhopla in marathi. 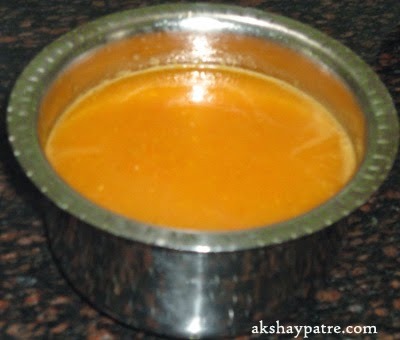 Pumpkins are also used to make sweet poori, pumpkin boiled in liquid jaggery is a very popular sweet dish. Now back to the pumpkin soup. This pumpkin soup is thick and creamy texture with slightly sweet and sour taste as i have added tomato in it. If you are looking for low calorie recipes, don't forget to add this soup in your diet. Usually pumpkin soup is served with cream on the top. But I don't add or garnish the soup with cream or butter. For better creamy taste, you can add two teaspoons of fresh cream for one bowl of soup. Wash and peel the pumpkin. 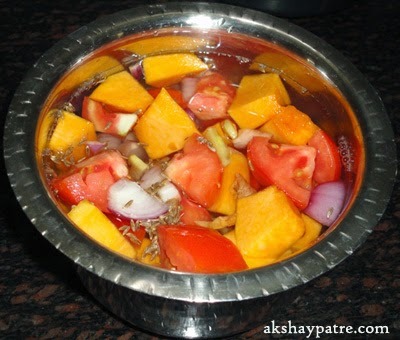 Take a vessel and add the pumpkin pieces, tomatoes, onion, ginger, pepper and cumin seeds along with 2 ½ cups of water. Pressure cook it on a high flame till 3-4 whistles. When the pressure releases, remove the vessel and keep it aside till it becomes warm. Once the pressure releases, remove from the cooker and keep it aside till it becomes warm. Then put the boiled pumpkin and other ingredients in a mixer jar and grind it to a smooth paste. and add salt. Bring the soup to boil. 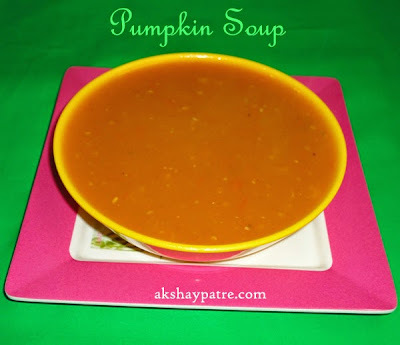 Garnish with a pinch of fresh pepper powder and serve the pumpkin soup hot. 1. Wash and peel the pumpkin. 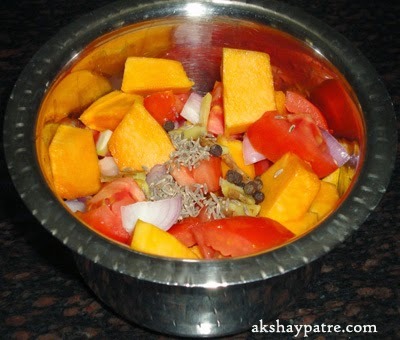 Take a vessel and add the pumpkin pieces, tomatoes, onion, ginger, pepper and cumin seeds along with 2 ½ cups of water. 2. Pressure cook it on a high flame till 3-4 whistles. When the pressure releases, remove the vessel and keep it aside till it becomes warm. 3. Once the pressure releases, remove from the cooker and keep it aside till it becomes warm. 4. Then put the boiled pumpkin and other ingredients in a mixer jar and grind it to a smooth paste. Add water if required. Transfer the paste to the same vessel and add salt. Bring the soup to boil. 5. Garnish with a pinch of fresh pepper powder and serve the pumpkin soup hot. I first had pumpkin soup at a restaurant's thanksgiving dinner and loved it. I am going to try this one.